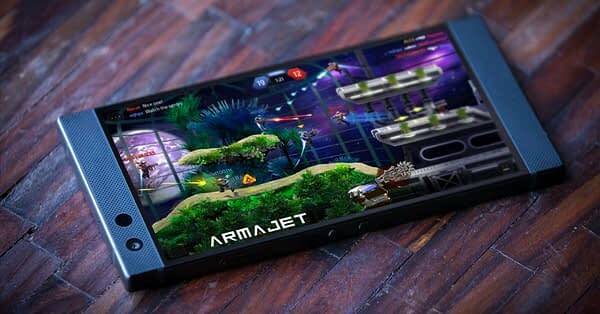 At Razer’s “Flagship // Gaming” event in Hollywood last night, the tech company and Armajet developer Super Bit Machine announced a partnership for Razer phone owners to get exclusive in-game content. Players who launch Armajet through the Razer Cortex mobile app will receive an exclusive Razer item in the game. In conjunction with the Raiju Mobile controller announced at this event, Super Bit Machine has also announced that they will support this and other mobile controller peripherals in Armajet. During the live stream keynote address with Razer CEO Min-Liang Tan, Armajet was shown during the segment announcing the Razer Cortex mobile app available for Razer phone users on Google Play. The Cortex service is essentially a discovery and reward platform for premier gaming titles. “Armajet on Razer Phone 2 looks and plays like what a serious gamer expects and wants. This is true 120Hz, 120fps gaming,” said Michael Breslin, Head of Sales & Marketing at Razer. While the Razer exclusive item is a bonus, and having a mobile app support controller peripherals is a novelty, and the Razer Cortex service is pretty nifty, the star of the show was always going to be the Razer Phone 2. Now you just have three more reasons to buy it.